Dlvr.it - You publish. We deliver. dlvr.it is a social content optimization platform. Our tools enable publishers, marketers and businesses to intelligently engage and grow social audiences by delivering their most compelling content to the right people at the right time. 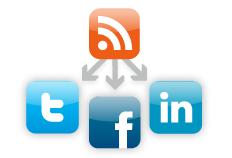 dlvr.it pulls content from any of your existing feeds and intelligently formats and delivers it to your social networks. dlvr.it's platform connects your social content* to Twitter, Facebook, LinkedIn and many more social networks. *social content = stories, blog posts, updates, photos, videos, jokes, ideas, entertainment, advertisements, deals, information, and anything else that can be shared online.